It's Bobbie's World: Do you know your history? I’m a day late doing this post, but better now than never. 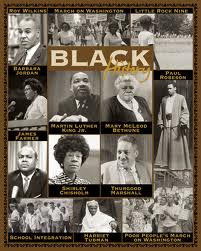 It’s February and you that what that means; it’s Black History Month. For as long as I can remember we always took this month and celebrated our history. We have learned about our history in school, from our parents and grand parents and we still have so much more to learn. It never gets old learning and having knowledge. Knowing the past is a benefit to everyone future. Take the time and learn your history.